Sterilization management is one of the final and most critical parts of the medical device manufacturing process. That is why we created a separate and dedicated facility to focus solely on this part of the supply chain. Our dedicated facility also contains a Certified ISO Class 8 (100,000) Cleanroom for the most extreme final assembly requirements. 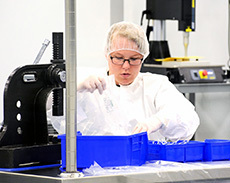 Our experienced team and robust quality systems stand ready to help in the final stages of your new product development process, including the critical management of the sterilization process. Contact us for all of your sterilization management needs.